The no longer acting chief is promoted to the rank of rear admiral. 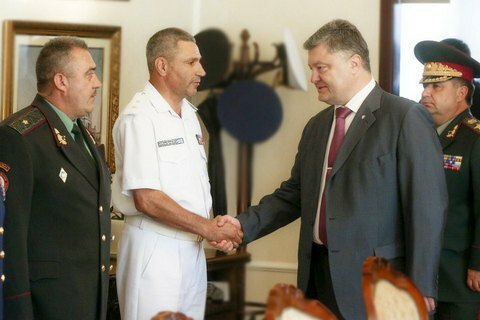 President Petro Poroshenko has appointed Lt-Gen Ihor Voronchenko as commander of the Armed Forces' Navy and promoted him to the rank of rear admiral, presidential adviser Yuriy Biryukov has said on Facebook. The news was also confirmed by the Defence Ministry's press service. Voronchenko was the acting chief of the Navy. Voronchnko was the deputy fleet commander in charge of coastal defence during the annexation of Crimea. He was in charge of the security operation forces in Luhansk Region. His last post was the head of the main main HR department of the General Staff. He was appointed acting chief of the Navy in April 2016.